Mercer Lake was originally created in the early 1980’s. Almost from its inception it was designed for hosting rowing events. 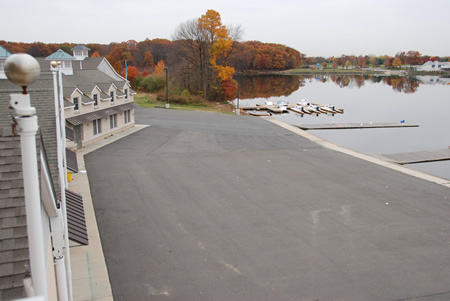 It has been the site of many United States National Team Selection events including the 1988, 1992, 2004, 2008 and 2012 U.S. Olympic Team Trials for Rowing. The Caspersen Boathouse was begun as a joint project between the Lawrenceville School and Peddie School to establish a home for their rowing teams. Ground was broken in 1997 for a three bay boathouse with a multipurpose room. In 1998, the schools moved into the boathouse. Each school occupied one of the bays and the third bay was used for rowing activities open to the public. In 2000 the Princeton International Regatta Association (PIRA) was formed. PIRA took the first major step toward fulfilling its mission by hosting a FISA World Cup event in 2001. In 2002 PIRA built on this success by hosting The Princeton International Invitational Regatta, another major international event. That year PIRA also founded the Mercer Junior Rowing Club (MJRC), a youth rowing program open to students from throughout central New Jersey. The rapid growth of MJRC prompted a boathouse expansion project that commenced in the Fall of 2002 and was completed in the Fall of 2003. The expansion was funded through the generous contributions of a number of private donors and the support of the National Rowing Foundation. The Finn M.W. Caspersen Rowing Center now accommodates MJRC, the Peddie School, the Lawrenceville School, the Hun School and the US National Team. In 2005 PIRA was renamed the Princeton National Rowing Association (PNRA) to reflect the greater mission of the organization to promote rowing at all levels.